Collision Control better known as Particle Accelerated Collision Technology (PACT). 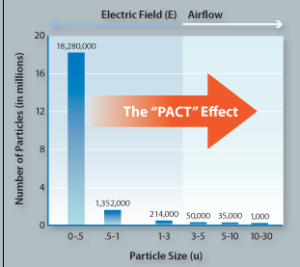 PACT is the only Technology available in todays’ marketplace which makes airflow the dominant transport mechanism for small particulates, such as bacteria, viruses, allergens, TVOC, gases and odors. SecureAire’s unique system is applied to improve indoor air quality in a building or home, reducing or eliminating harmful particulates which can either cause sick building syndrome or worse, the spread of dangerous airborne pathogens. SecureAire is the only device that simultaneously increases the overall filtration efficiency (the capture rate of particulates/pathogens in the air) and has the potential to kill or inactivate these same dangerous organisms. The company latest Technology Development is called Particle Guide Technology (PGT), which addresses the costly issue of static pressure, associated with today’s mechanical filtration systems. SecureAire’s technology will prove to be an industry leader in the years to come as it has the ability to be applied to a wide variety of applications previously bound by the application of standard mechanical filtration, ion generation and other electrically enhanced technologies. In summary, SecureAire is well positioned with its current Product and Technology Platforms and also continues to develop future “break-through” technologies in the air purification space. Interested in more information on this product, email us.